Markus at summit. Photo Markus. 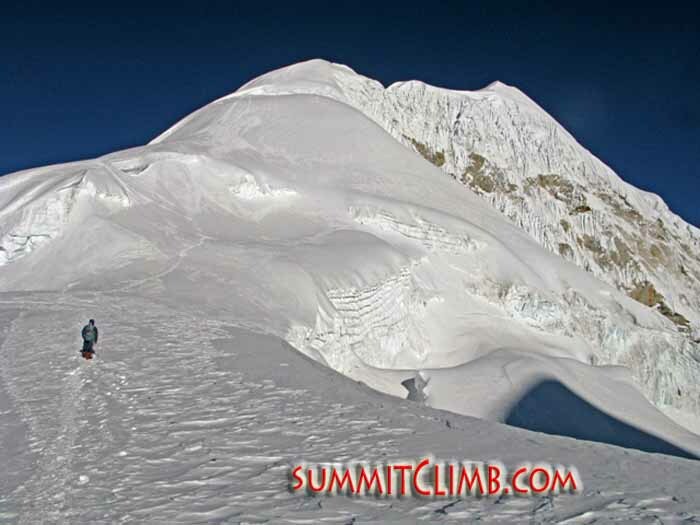 At 7,129 metres (23,390 feet), Baruntse lies in the heart of the Himalayan giants of Nepal and has a higher summit success rate than comparable peaks. 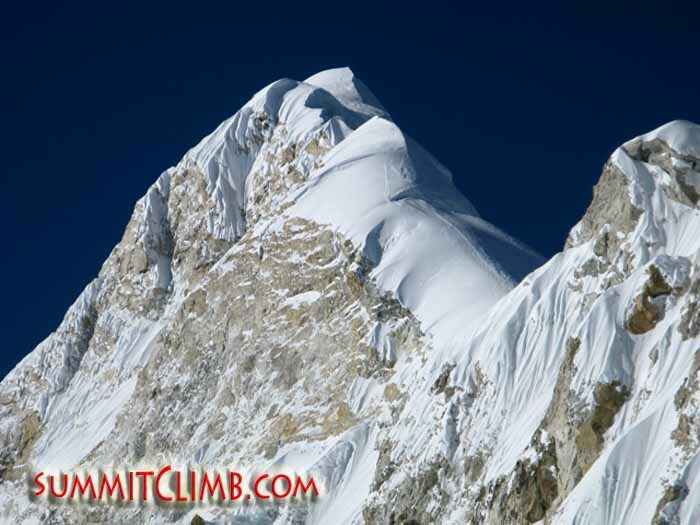 Our expedition offers an opportunity to climb this classic 7,000 metrepeak, located in a more remote area of the Khumbu region in Nepal in a relatively short amount of time. 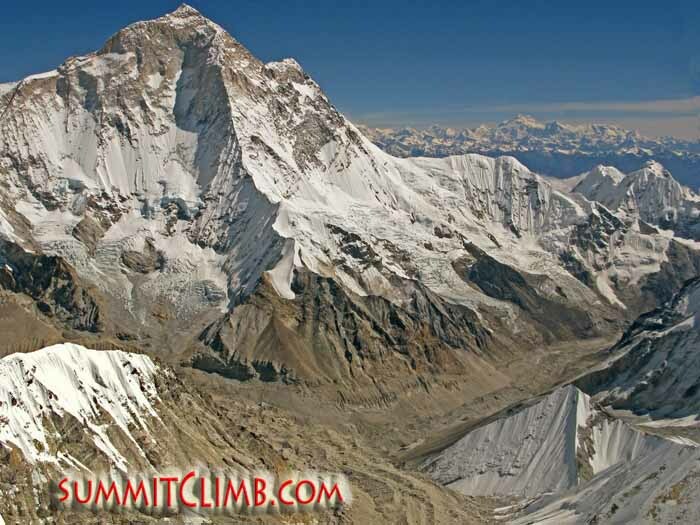 The summit affords some of the best views of Everest, Lhotse, Makalu, and Cho Oyu that can be seen anywhere in the Himalaya. 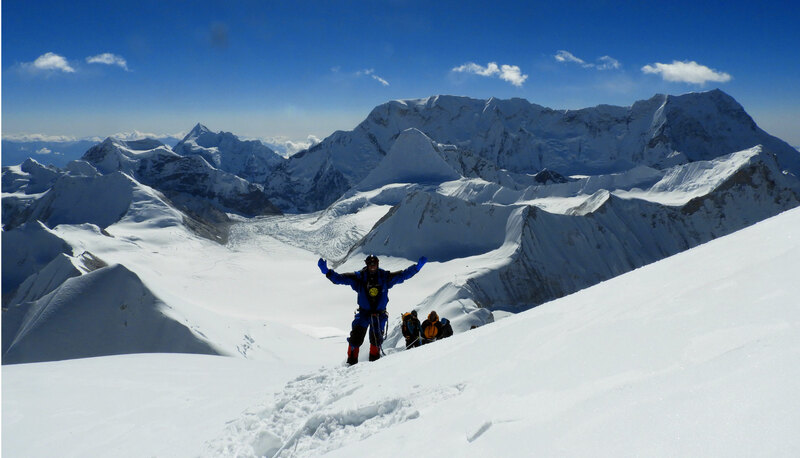 Our Baruntse/Mera trip gives members the opportunity to warm up on Mera Peak, 6,476 metres (21,247 feet). 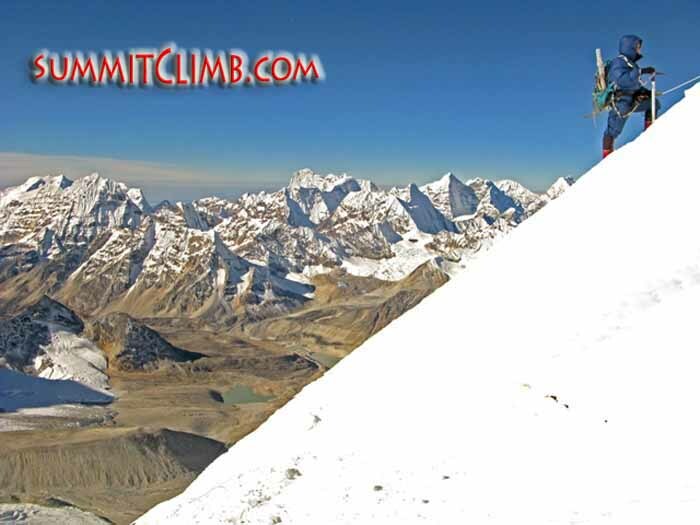 Mera Peak is a classic, easier, Nepali peak. It is an excellent training ground for the more challenging Baruntse. Both trips (Mera/ Baruntse and Baruntse only) cross the incredibly beautiful AmphuLabtsa Pass, 5,845 metres (19,177 feet). 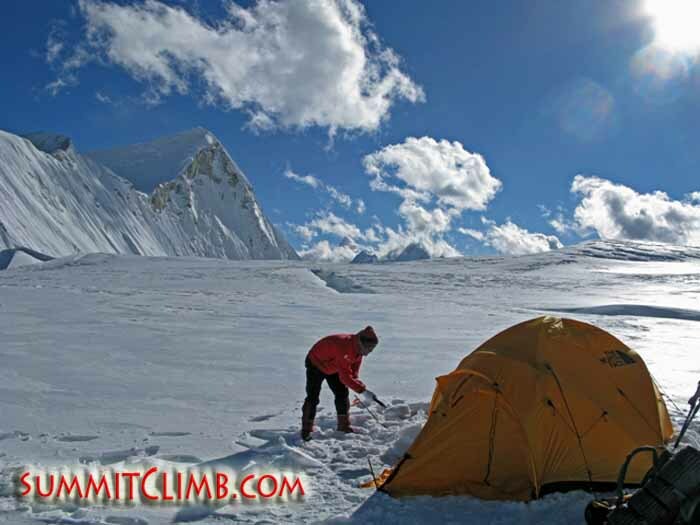 This stunning pass is one of the most impressive passes in the Himalayas and is one of the highlights of the expedition. 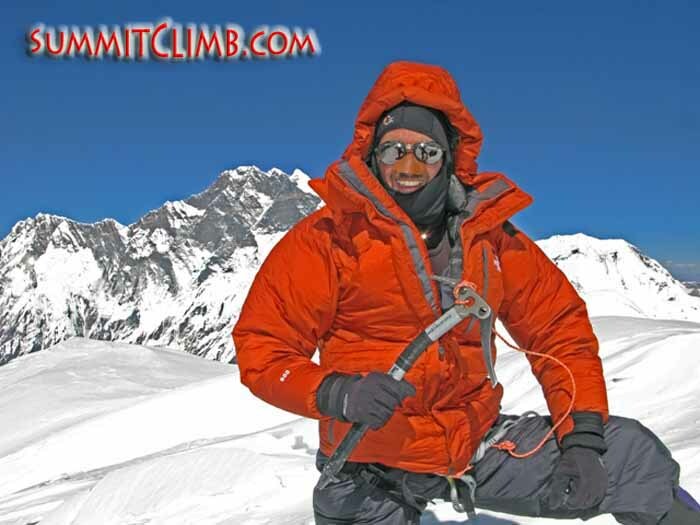 1) Arrive Kathmandu 1,300 meters (4,265 feet). Stay at hotel. 2) Orientation day in Kathmandu. Stay at hotel. 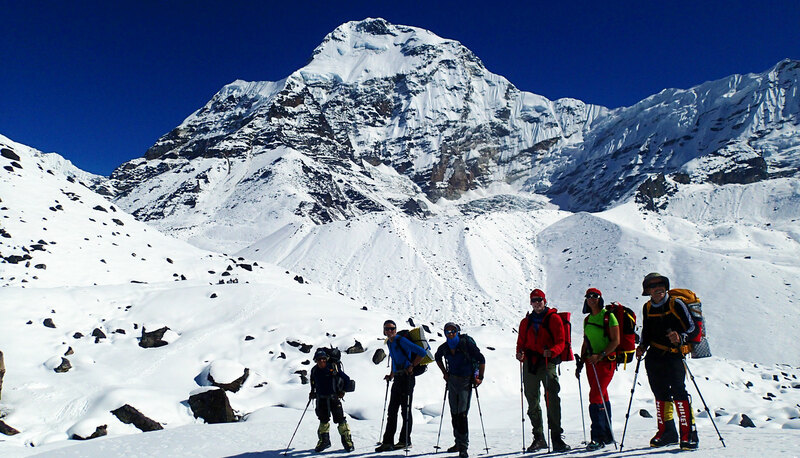 4) Trek to Chutanga, 3,474 metres (11,398 feet). 33) Extra day in Kathmandu, in case of delay, and for sightseeing, gift shopping, celebration, saying goodbye to new friends. Saty at hotel. 3) Fly to Lukla 2,860 metres (9,383 feet) Trek to Phakding, 2,650 metres (8,694 feet). Stay at tea house. 4) Walk to Namche Bazaar (3,440 metre/11,286 feet). 5) Rest, acclimate, and relax in Namche Bazaar. 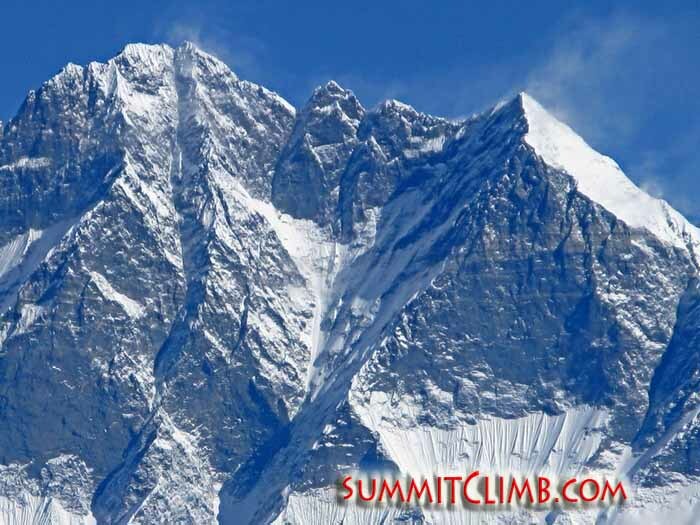 6) Trek to Pangboche, 3,985 metres (13,074 feet). 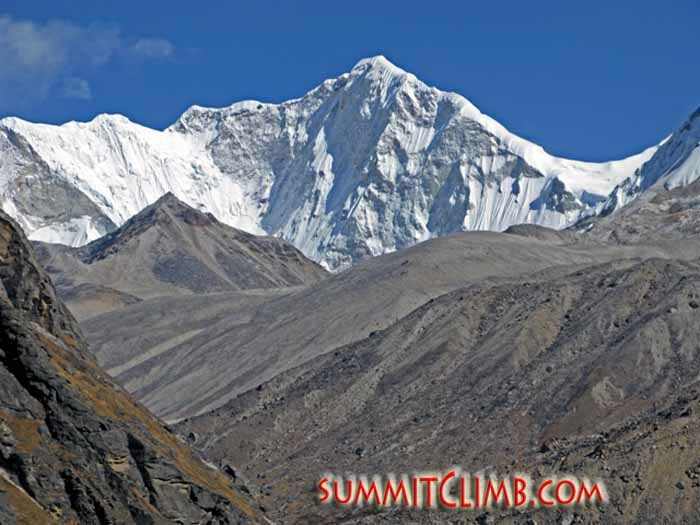 7) Walk to Dingboche, 4,410 metres (14,469 feet). 8) Rest and acclimatization in Dingboche. 9) Trek to the village of Chukhung, 4,750 metre (15,584 feet). 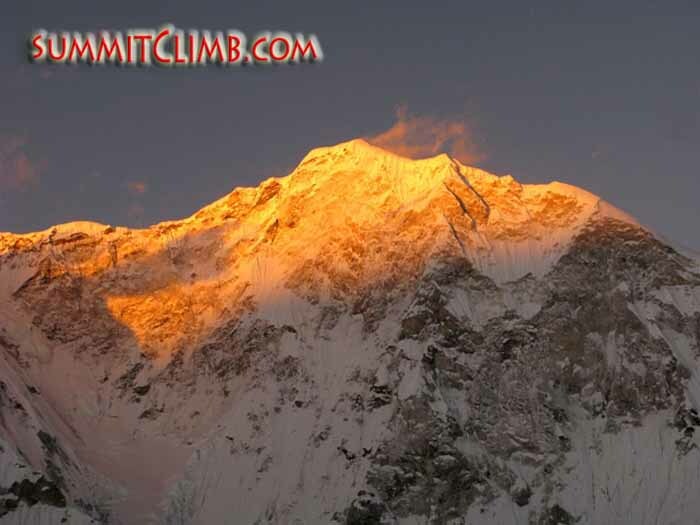 10) Walk to AmphuLabtsa High Camp, 5,213 metres (17,103 feet). 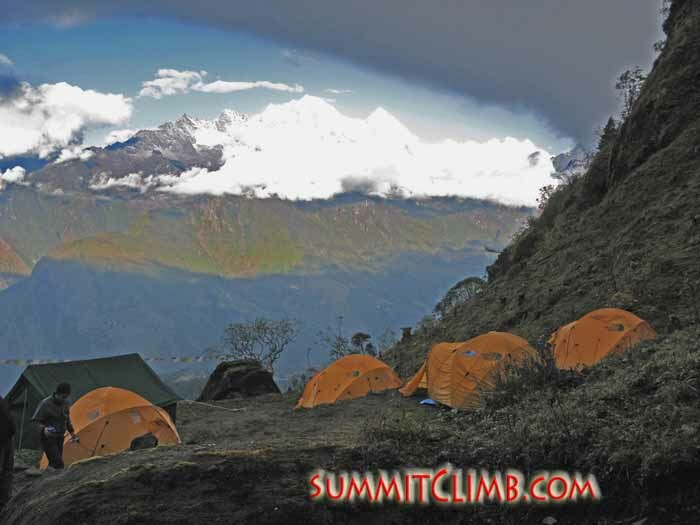 11) Rest and acclimatization in AmphuLabtsa High Camp. 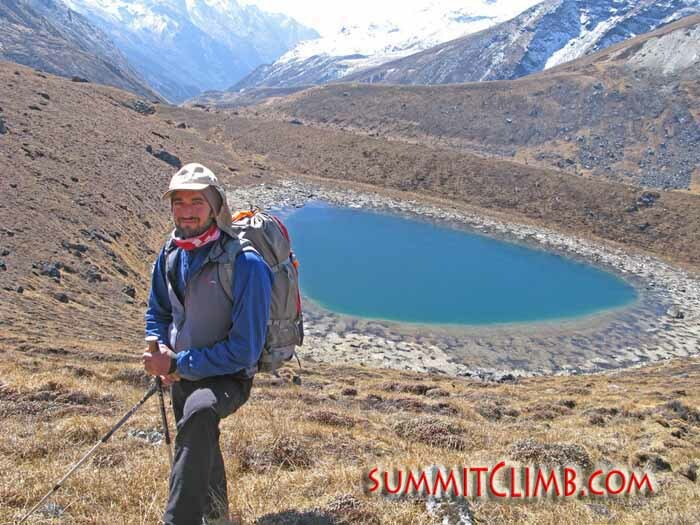 12) Cross the AmphuLabtsa Pass,5,845 metres (19,177 feet) descend to PanchPokhari and camp, 5,274 metres (17,303 feet). 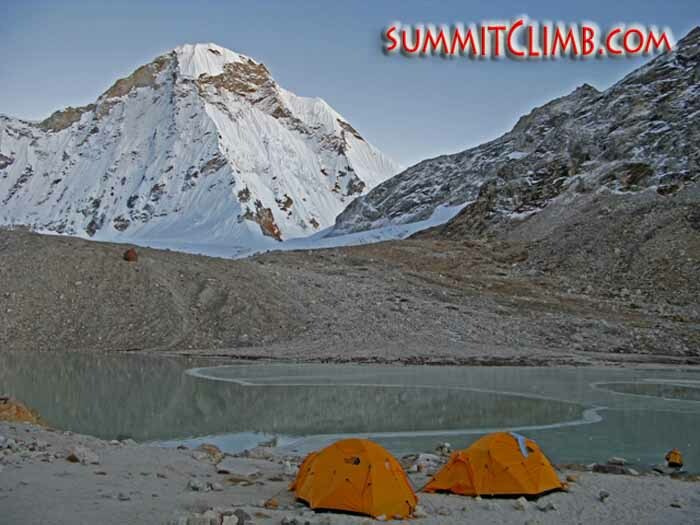 13) Walk to Baruntse basecamp, 5,300 metres (17,388 feet). 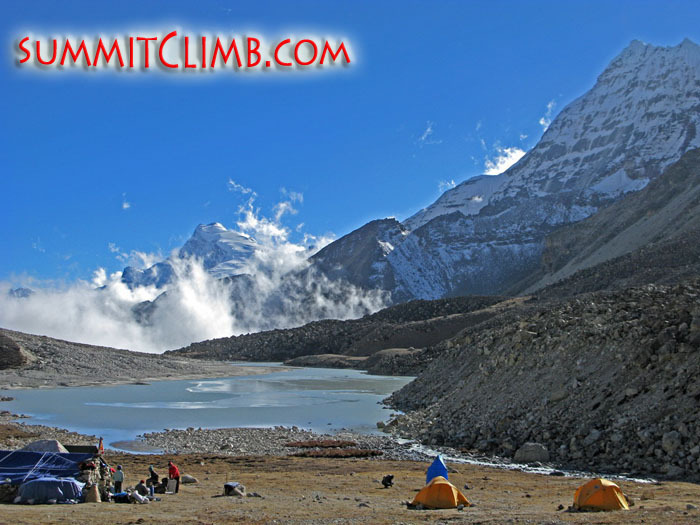 14) Walk to Baruntse Advanced Base Camp at 5,800 metres (19,029 feet), return to Baruntse basecamp. 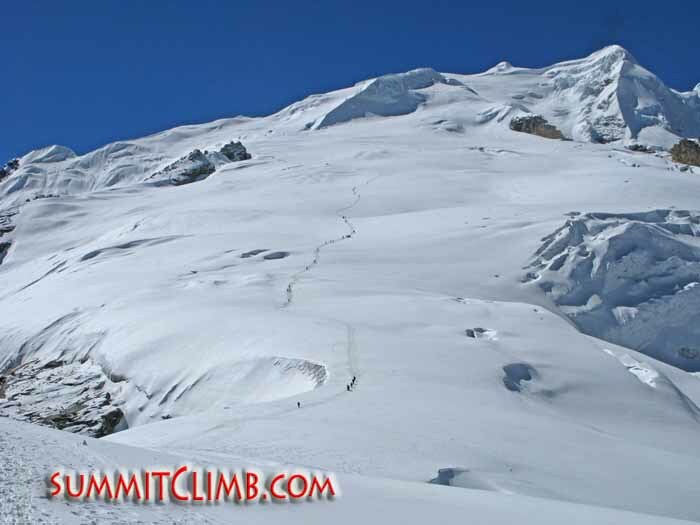 15) Climb to camp 1 (6120 metres/20,100 feet). 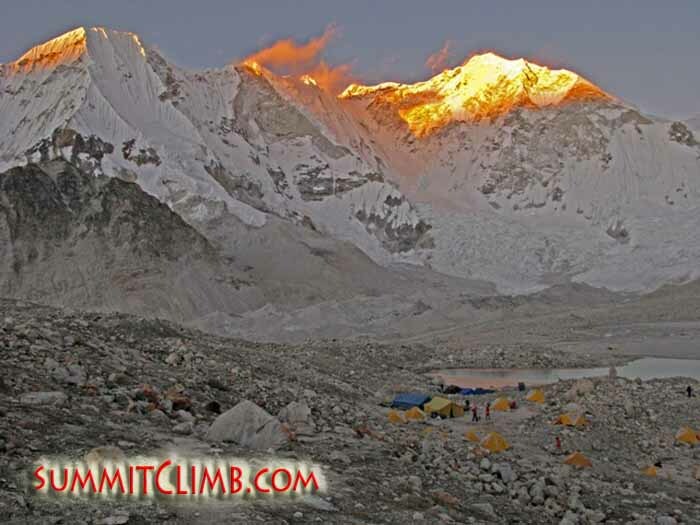 16) Short climb to camp 2 at 6400 metres/21,000 feet, return to Baruntse basecamp. 17) Rest in Baruntse Basecamp. 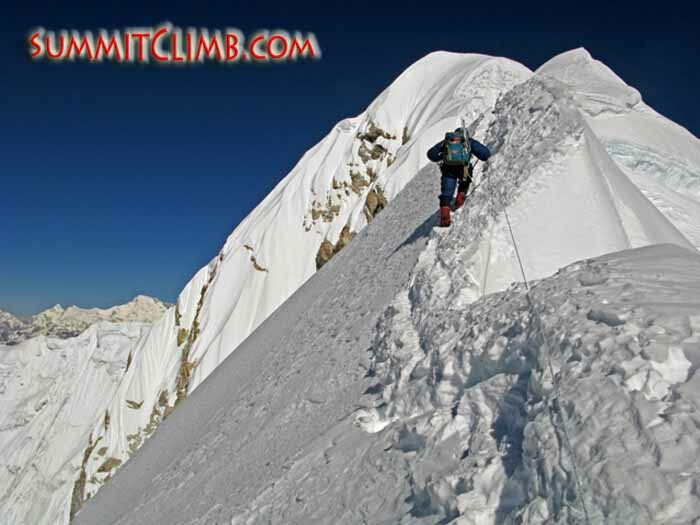 18) Climb to camp 1, 6,126 metres (20,100 feet). 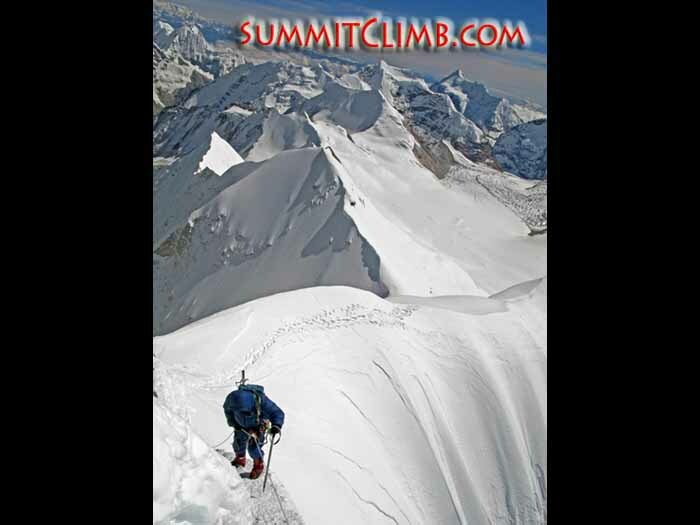 19) Climb to camp 2 at 6400 metres (20,997 feet). 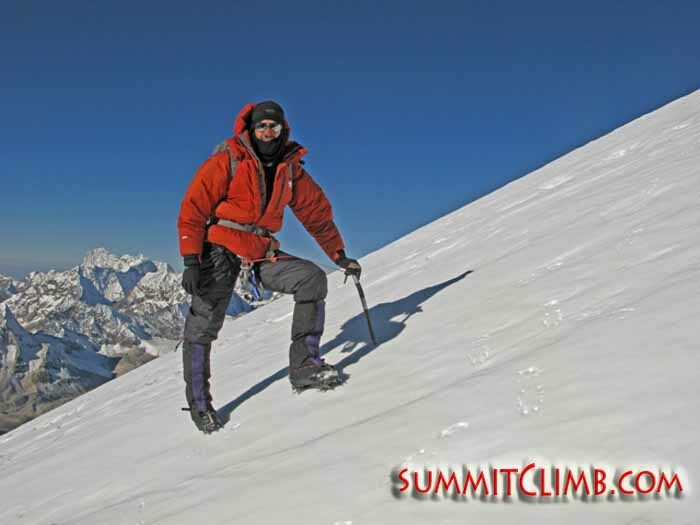 20) Summit attempt, 7,129 metres (23,390 feet). 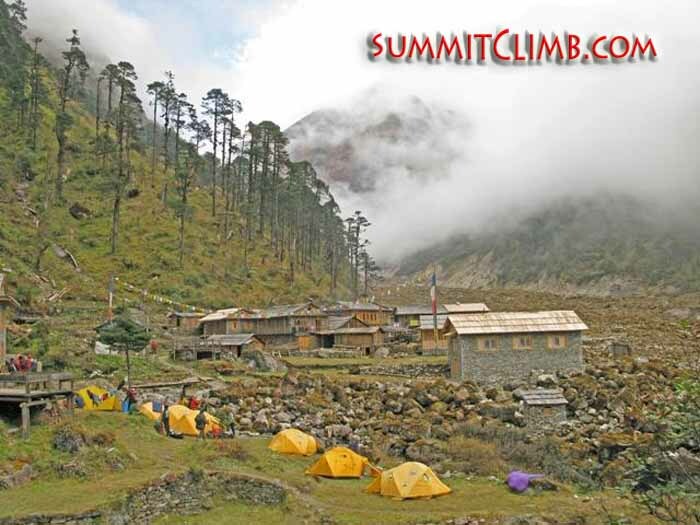 22) Extra day for summit attempt, return to basecamp, pack and prepare to depart basecamp. 23) Pack and depart basecamp; walk down the Hongu Valley to KongmaDingma at 4,540 metres (14,895 feet). 24) Cross Mera La Pass at 5,300 metres (17,388 feet), descend to Tagnag at 4,300 metres (14,108 feet). 25) Walk to Chetra Village at 4,200 metres (13,780 feet). 26) Walk to Lukla at 2,800 metres (9,186 feet). 27) Flight to Kathmandu. Stay at hotel. 29) Fly home. Thank you for joining our Baruntse expedition! 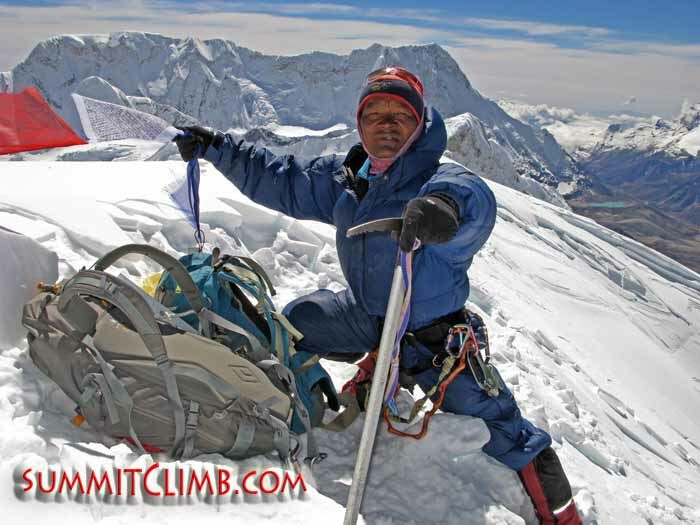 On the way to Summit of Baruntse. Photo Scott. 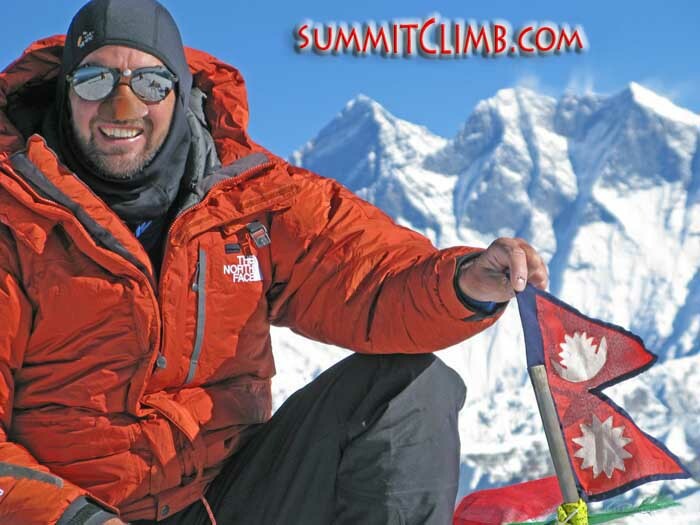 Leadership: Dan Mazur is a relaxed, friendly, well organized, and highly skilled professional with over 20 years of experience leading people to the summits of Everest, K2, Broad Peak, Gasherbrum, Cho Oyu, Lhotse, Manaslu, Shishapangma and Baruntse. 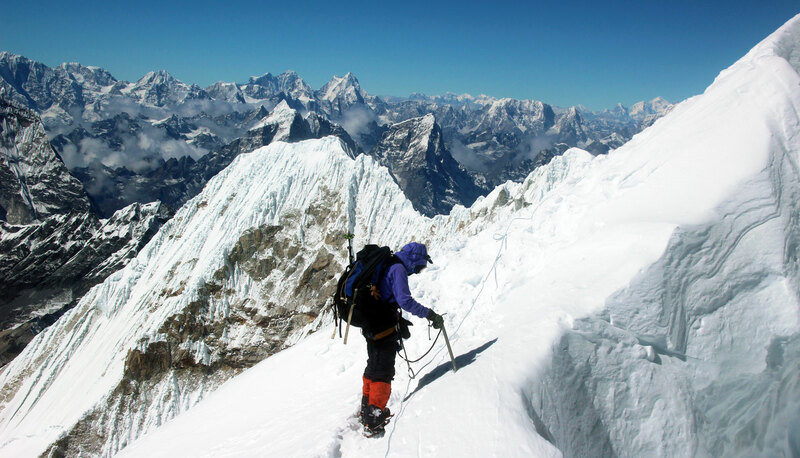 Extensive experience is not required for climbing Baruntse. The most important thing is for members to be in adequate walking fitness. 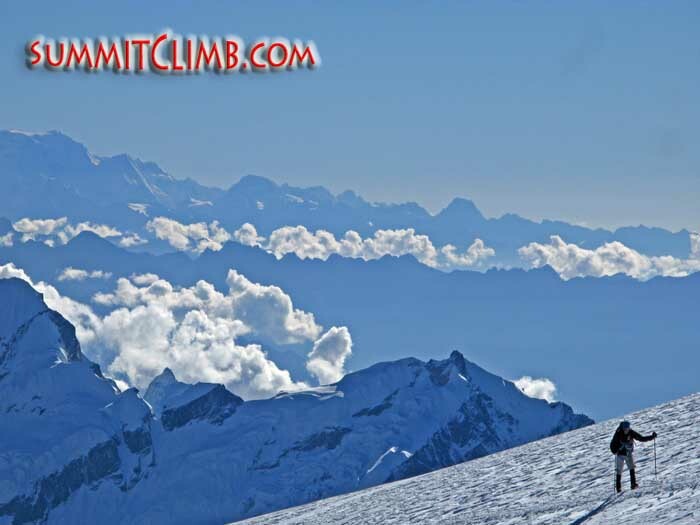 You may attempt this climb as a novice and we will teach you what you need to know. No further experience is required. 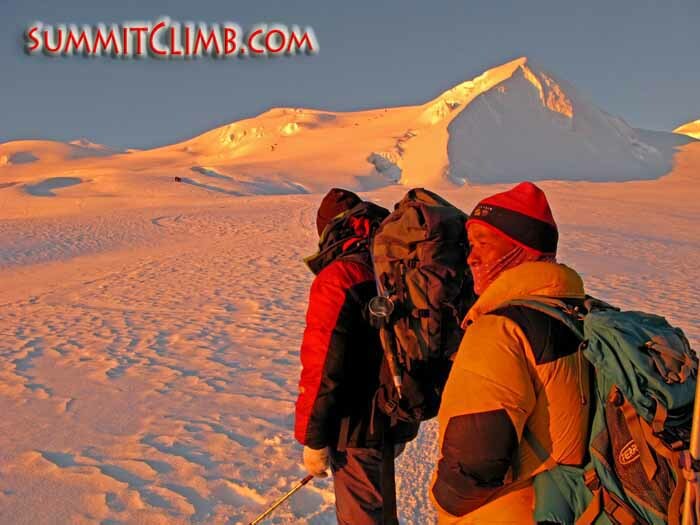 To participate in this expedition you must be a very fit and active winter-walker-climber in good health. 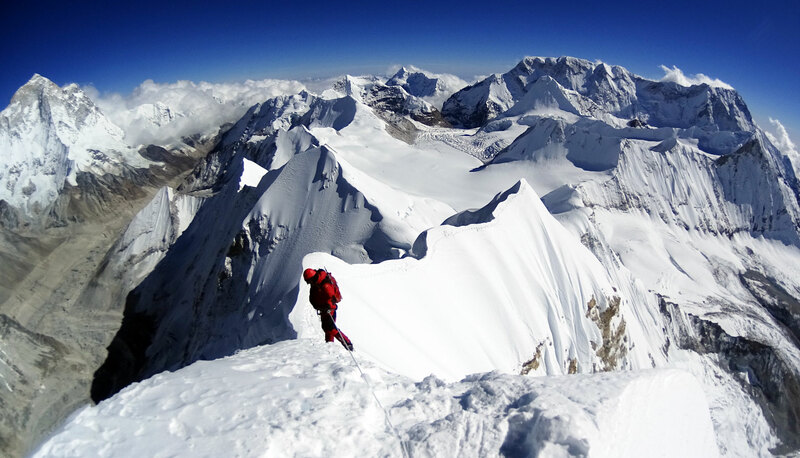 Prior to joining our group, please see your doctor and obtain the necessary permission and advice, as well as medications for travel in extremes of altitude, and also for exotic locales. Baruntse is a great expedition, and the Mera preliminary is a good test. The general experience of the sherpas and leaders is evident in terms of deciding strategy and defining daily schedules, this also implies that the tent, porters and kitchen teams work in a very effective way. First of all.. I'd like to thank your wonderful team for my first experience to join an international OPEN group expedition. zero snow (no four season) and Jakarta is "zero" sea level. so I learn a lot from all friends I met. So silent+peace. and Baruntse itself stands so challenging. even I missed the summit. but I like 'em all. I won't forget the crossing Panch Pocari that surprised me with beautiful ponds. Then ascending the ICE CAKE on the West Co. I never imagined how beautiful it is.. And finally Amphu Labtsa. it's stunning. Came into the pass to get secret of the other side. and descending way is unbelievable !! So I recommend this triple trip Mera-Baruntse-Amphu Labtsa. since Mera only is to short and considered as "warming up". I like your kitchen's team "chef" and his smiling kitchen boys. who really support us. I have no probrem with the food. Hot chocolate is the most valuable item. The campsite chosen by Sherpa is good. Porters are really strong and walk so fast. - International team: good teamwork and gathering of people. 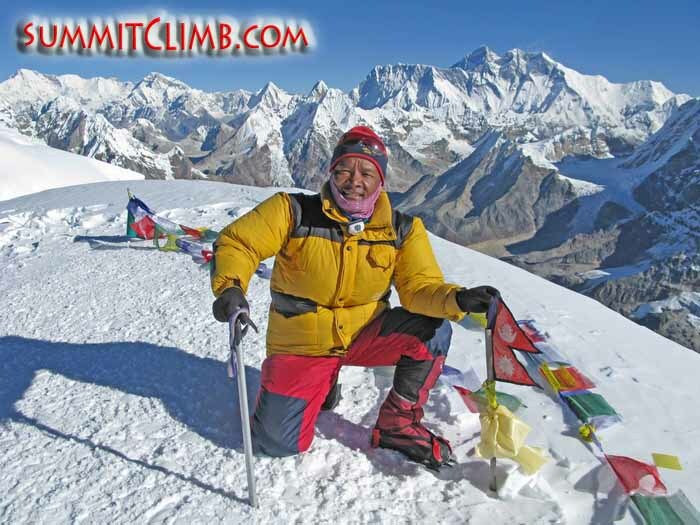 Yes indeed we met your Baruntse leader in Khare, and then had lots of contact with him through the climbing period in Base Camp. I believe your group summited Baruntse with 8 or 9 clients on about the 3rd of Nov. We then summitted (3 of us + 3 sherpas) two days later. We were very lucky with the weather, as you may have heard. There was a big snow fall around the 1st of Nov that made things look pretty iffy. There's no doubt that the trail and the ropes set up by your group were a massive help for our summit bid... so if you could pass along our thanks to your leader, that would be greatly appreciated. We didn't get a chance to thank him personally before they left.